SpaceX's Falcon 1 rocket is being readied for a second test launch in January 2007. The privatelaunch firm SpaceExploration Technologies (SpaceX) is reviewing the results of a Thursdayrocket engine test in preparations for the second test flight of its Falcon 1booster. 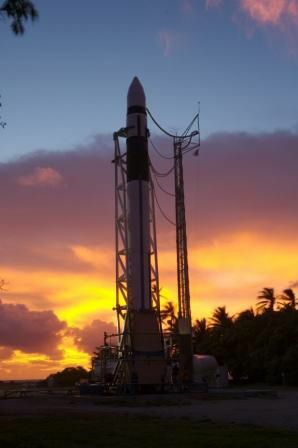 The ElSegundo, California-based firm checked the Falcon1 rocket's engine during a static fire test Thursday at its Omelek Island launch pad on the Kwajalein Atoll in the Pacific Ocean. "It wentoff very well and no anomalies were detected," SpaceX CEO Elon Musktold SPACE.com late Friday of the engine test. "We're still digestingthe data from that." If the resultsare favorable, SpaceX may prepare the Falcon 1 rocket to fly sometime during a four-daylaunch window that opens March 19. The test flight has been delayed severaltimes due to equipmentand rangesafety issues. The plannedspace shot is a demonstration flight for the U.S. Defense Advanced ResearchProjects Agency (DARPA) and will be the second test launch of SpaceX's Falcon 1booster since its unsuccessfuldebut last year. Since that initialflight, Musk said, SpaceX engineers have made a host of improvements to therocket and its launch site infrastructure. The Falcon1 rocket is a 68-foot (21-meter) booster with a reusable first stage designedto parachute down to an ocean splashdown for later recovery. SpaceX hasscheduled a total of three Falcon 1 launches for 2007.